Udumalpet, Tirupur Dist, Tamil Nadu. 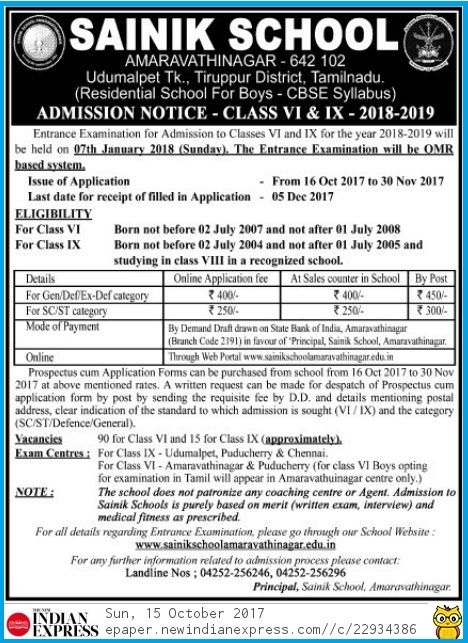 Sainik school, Amaravathinagar Entrance Examination for Admission to Class VI and IX for the year 2018-2019 will be held on 7th January 2017 (Sunday), The Entrance Examination will be OMR Based System. Sainik school, Amaravathinagar is an English medium, residential school for boys providing Public School Education with a military bias, located at Udumalpet, Tirupur Dist, Tamil Nadu.